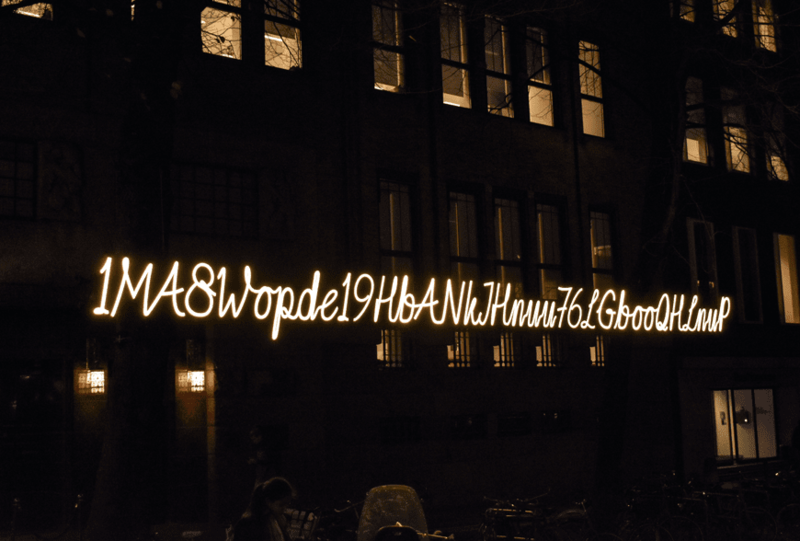 For the 7th edition of Amsterdam Light festival, designer Frederike Top created a special work of art. In front of the former bank building The Bank you will find her artwork "Code". The total off 34 letters and numbers are not random, the chain is the address of a real bitcoinwallet. This year's theme of the exhibition is "The Medium is the Message". Code is an important 'language' of our digital age. All texts, images and sounds that we see on our computers, tablets and telephones, can be converted to codes. Bitcoin is also part of this modern code language. Thanks to this new technology, transactions with the digital money cannot be manipulated and are insightful for everyone. This is a threat for the government and banks, because there is no need for central control over the transactions. The Bank, the building the artwork is placed in front of, symbolizes this threat. Code is a sequel to the series of poetic Street Sentences “Vespucci, you are beautiful” in Amsterdam West that Frederike Top made earlier. The artwork is deliberately written with an 'old-fashioned' manuscript. After all, the oldest script in the world, the cuneiform script, was also invented to record property, contracts and transactions. Perhaps the most beautiful part of this artwork is that you can use this bitcoin to make a donation the charity “Huis van de Tijd”. With the donations, they want to offer elderly with dementia a boat cruise through Amsterdam Light Festival. The 34 letters and numbers are custom made.